Danny Caine — Teacher of the Year! I returned home last Friday to find a wonderful surprise waiting for me. Inside a manila envelope postmarked Smithville, Ohio, was a packet of letters from Danny Caine’s 10th-grade English Class at Smithville High School. Mr. Caine explained that he had recently assigned A.D. to his class, and that it had been a rewarding experience for all involved. As Mr. Caine wrote, "My students were 11 when the storm hit, and so it felt pretty current to them. Yet they were still too young to understand the weightiness of the situation, and A.D. opened their eyes." Because of budget issues, Mr. Caine chose to use the original, online version of the book (on "SMITH Magazine’s fantastic website"): "… Online reading is a novel yet relevant way to experience text; as nonlinear web reading becomes more common, your online presentation of A.D. (with informational links for many panels) matched the style of literacy that students are comfortable with. In addition, the links lent gravity to the material, and served as important reminders that this was indeed nonfiction." I’m really overwhelmed by this package. Not only does it thrill me beyond words to know that A.D. on SMITH has continued life, but to think that actual students are taking advantage of all the site’s resources is more than I ever could have imagined. (After all, I put most of those links together!) And the individual letters from the kids are really touching — filled with questions, comments, and appreciation. I still haven’t worked my way through them all, as I’m savoring each one individually. I’m so grateful to Mr. Caine for exposing his students to the unique educational potential of comics in general, and A.D. in particular. And of course for taking the time to let me know about his class’s experience. I plan on sending the class a personalized hardcover of A.D. And of course letting Mr. Caine know that, should he care to teach Katrina through A.D. again in the future, that there’s a free teacher’s guide online, and that the more economical A.D. paperback is due out in August. Three cheers for Danny Caine! Throughout the last two years, while I was toiling away on A.D., sitting on the little cart next to my drawing table was a script for a story I wrote called "The Tacky Tic." All during these past two years, I never was able to get to the piece and actually draw it. But now that A.D. is finally done — huzzah! — I have finally been able to fulfill my true passion! And you are the lucky beneficiary. I think the piece is a powerful statement on the human condition, and I’m sure you’ll agree. Just click your mouse on over to ACT-I-VATE and check out "The Tacky Tic" in all its glory. In commemoration of my 20-year high school reunion, I thought I’d post this piece, verbatim from June 1985. I’m sure it’ll be of absolutely no interest to anyone out there other than man_size, eyehawk, comfortslut, thamesrhodes, larrondo, and al_monster… or any other graduates of Music & Art/LaGuardia from that era. My high school, Music & Art, in New York City (no, not the ” Fame school”), was well-known for the imaginative Halloween costumes of its students. After all, this was a school full of artists and creative people! I found out about M&A’s Halloween spectacular soon after I started there in 9th grade and as the holiday got closer and closer, the pressure started to mount. I don’t know how I got the idea, but I finally decided my costume would be a school late pass. Yes, one of those little slips of paper you’d get from the principal’s office and give to your teacher when you were late for class. It had a bunch of bureaucratic jargon at the top of the slip, a large title, “LATE PASS,” some lines where the reason for your lateness was filled in, and more official language at the bottom. At home, I took a pass and sized it up to sandwich-board size, making sure to get all the proportions right, and imitating the typeset lettering as well as I could. This was all before computers, so I really had to be inventive, using my calculator and ruler to figure out the correct multiplier to keep the dimensions consistent. Once I had created my masterpiece, I punched a couple of holes in the top, ran some string through them, and wore the pass like a sandwich board. 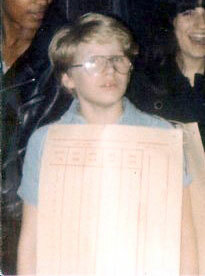 I was a huge hit at school! It was definitely a one-of-a-kind costume and the other kids (and teachers) were bemused at my idea — and execution of it. After that, I decided I had to be some kind of school-related card for my costume every Halloween. My sophomore year I was a Delaney card, which was a tiny card used to track students’ contact information and attendance during the school year. Pretty weird, and once again quite popular with the other kids. Junior year I was a subway pass. That was a fun one to do, as each month’s pass was color coded (October 1983 was grey), and there was a cool water-marked code, “R-1,” stamped on each card. Not to mention the logos of the Board of Ed and the MTA. 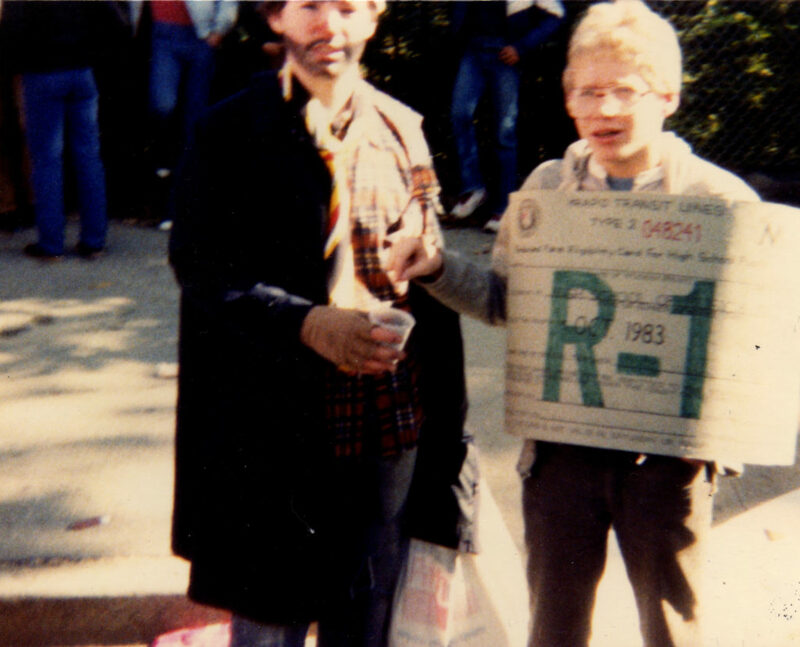 By junior year I had developed a reputation as the kid with the school card costumes, and I remember posing for a lot of pictures that Halloween as we paraded around the street in front of the school. 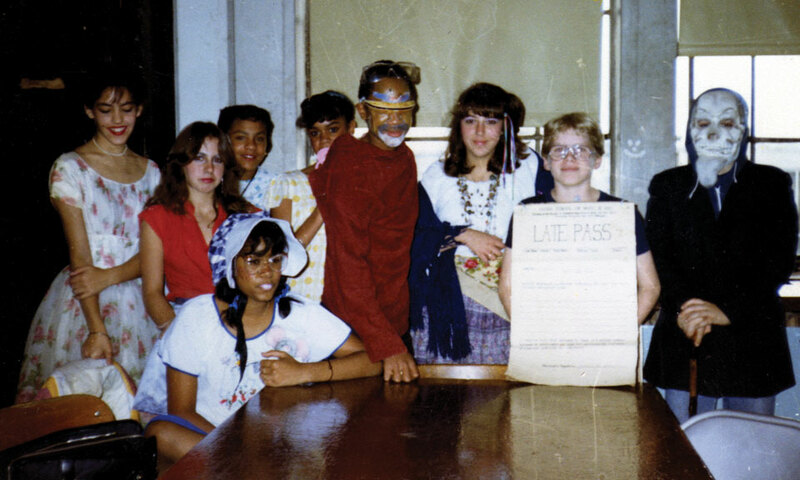 My senior year we moved to a new building, down at Lincoln Center, and we merged with Performing Arts (yes, the “Fame school”) to become a new entity, LaGuardia High School. 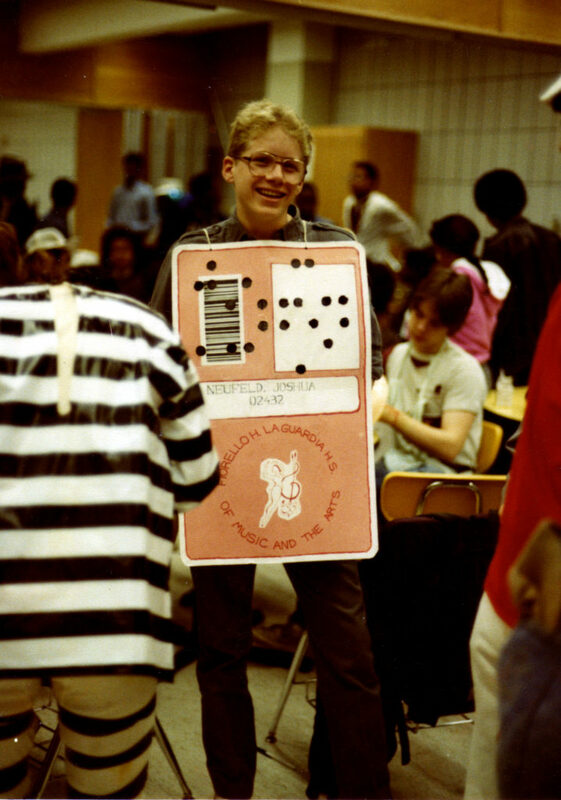 But the Halloween tradition continued, and that year I was a school ID, complete with bar code, my student ID number, and the new LaGuardia logo. When we showed up at school each day the card was fed into a card reader, and it had a bunch of cool little holes in it; I duplicated those as well. Altogether, it wasn’t a bad reproduction. And with that final success I ended my high school Halloween career.